be a man without dreams. And I don't want to live like that.'" Just how many 'making of' documentaries get their own DVD release? The one that springs most readily to mind is Keith Fulton and Louis Pepe's Lost in La Mancha, but this has to be considered a special case, only growing into a feature after the film whose production it was commissioned to document – Terry Gilliam's The Man Who Shot Don Quixote – collapsed following a string of unfortunate disasters. So what does that leave? OK, let me restate that original question for DVD aficionados: How many making-of documentaries get a stand-alone DVD release from US home video supremos Criterion? Yeah, Burden of Dreams is regarded that highly. 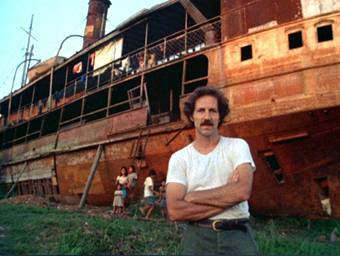 Werner Herzog's 1982 Fitzcarraldo is a film about obsession made by one of cinema's most notorious obsessives. It was also a work that, like Gilliam's above-mention and still unfulfilled project, ran into a spectacular series of production problems, most of which were (often wrongly) attributed to Herzog's single-mindedness and complete disregard for the comfort and safety of his actors and crew. Much of this hit the news stands while the film was in production, prompting Herzog and his producers to ban all press from visiting the location, which only served to feed the negative stories about just what was going on deep in the Amazonian jungle. 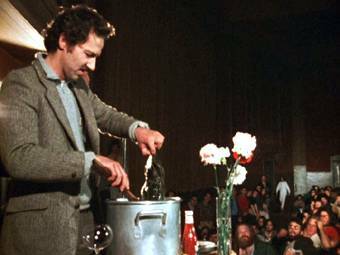 The only people documenting the shoot were ex-Berkeley graduates Les Blank and Maureen Gosling, who had been invited in by Herzog following his starring role in their unambiguously titled short film Werner Herzog Eats His Shoe (see the extras below). They first joined the project late in the pre-production for two weeks in October 1979, then returned in April 1981, by when the film had already hit one potentially production-busting problem, and ended up staying for two-and-a-half months. By the time they left, Blank had become weary of the whole experience and just wanted to get home. Despite the differing outcomes of the productions being documented, the similarities with Lost in la Mancha are noteworthy, as despite Herzog's eventual success, the film cannot help but highlight the problems rather than the successes (something emphasised by the dourly delivered narration), and it's certainly that aspect that made the biggest impression when I first saw the film back in the mid-80s. Indeed, the memory distortion caused by the passing of time had me convinced that the shoot was far more problematic than it clearly was, though since then I have also seen Hearts of Darkness (another eye-opening record of film-makers, obsession and the jungle) and My Best Fiend, Herzog's portrait of his friend and collaborator Klaus Kinski. The second of those films in particular threw me off, containing as it does an extract from Burden of Dreams showing Kinski screaming blue murder at production manager Walter Saxer, a scene that was not actually included in the film (again, see the extras below). By comparison, the moments of confrontation that have been included are a lot more sedate, and some of the most alarming incidents are related through voice-over and interview rather than shown on screen. As a portrait of an obsessive perfectionist, Burden of Dreams is consistently fascinating, and though some have seen it as evidence of Herzog's legendary semi-lunacy, for this young ex-film student who sat open-mouthed on that first viewing, Herzog came across as a man completely and utterly dedicated to his vision, to the extent that he seeming willing to lay his life on the line to realise it. I didn't appreciate it at the time (how could I? ), but he was everything I wished I was but would never be. Of course, he had also made the staggeringly beautiful Aguirre, The Wrath of God. In my early twenties I firmly believed that Werner Herzog was a filmmaking God. Burden of Dreams unfolds as a study of ambition at war with a combination of circumstance, an alien environment and even simple logic, and in that respect is as compelling and incident-filled as the aforementioned Hearts of Darkness and Lost in la Mancha. Without doubt Herzog's biggest set-back occurred between Blank and Gosling's two visits – and was thus not captured on film – with the departure of lead players Jason Robards (illness) and Mick Jagger (musical obligations) after forty percent of the film had already been shot. This meant recasting and starting again from scratch, something that would have frankly floored most productions at this stage. On top of that, Herzog was having to deal with an increasingly hostile indigenous population and outrageously false stories appearing in the press suggesting he was running drugs and guns and destroying local farmland. Eventually the film crew were driven out and their sets and living quarters burned, forcing a relocation that took them even deeper into the jungle than originally intended. Even then Herzog was faced with the task of hauling a gigantic steamboat over a mountain, something he insisted on doing for real, in spite of the protestations and eventual resignation of his Brazilian engineer and the seemingly impossible nature of the task. At this point in the production, Herzog and Fitzcarraldo had become virtually indistinguishable from each other, both faced with the same almost impossible physical challenge in order to realise their respective dreams. Even this, though, pales in comparison to the decision to take the giant boat into rapids with the cast and crew on board – as the boat collides repeatedly with the rocks, cameraman Thomas Mauch is injured and even Blank quits shooting in order to protect himself from harm, creating a very real sense that Herzog's obsession has disabled his sense of self-preservation. And yet, by God, I wanted to be on that boat, to share the danger in order to get footage that just no-one else would dare to pursue. I was not at all surprised when I read in Blank's own diaries that Herzog, Kinski and Mauch were positively jubilant after this river trip, overcome by the adrenaline rush of having diced with death and survived, and knowing that they had created something special in the process. Looking back from an age in which spectacle is largely created on computers, the foolhardy daring of this decision, coupled with its reckless sense of adventure, is something to be treasured. 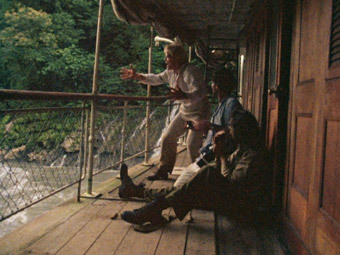 More than just a record of the technical aspects and difficulties of the Fitzcarraldo shoot, Burden of Dreams has an ethnological element, with the lives and even conflicts of the local tribespeople made very much part of the story. Although the most serious incidents happen off-screen, their gravity is nonetheless sometimes effectively communicated – the news that a couple have been hurt in an attack by a rival tribe is horrifically illustrated when we are shown their injuries (which are successfully treated by the camp's doctor) and the arrows used to inflict the wounds, which are closer in size to what we would think of as spears. As the problems pile up, even Herzog shows signs of losing heart, cursing the jungle and nature itself as obscene in a powerful monologue laced with frustration and bitterness. By now, though, the director has invested too much time, energy and blood to give up, and had by then promised that he would either finish the film or walk off into the jungle and never return, a statement those around him knew was sincerely made. The film's many strengths are retrospectively tempered to a small degree by the additional information supplied by the commentary and accompanying diaries and the knowledge of what was not captured on film. Chance certainly plays its hand here, but so does Blank's own decision to switch the camera off at moments when others may have kept on rolling, and Herzog himself maintains that the film documents only a small part of the shoot and that many key events were not caught on camera. Blank's decision to leave the production before its completion is understandable once you read the diaries, but it does rob the film of Herzog's most triumphant success, when the boat finally reached the top of the mountain. Extracts from Fitzcarraldo are a compromise stand-in, lacking as they do the reactions of those involved that the scene cries out for. But although this post-production analysis can create a slight sense of incompletion, this has to be put into perspective. The coverage may be greater in Lost in La Mancha, but it is important to remember the sheer speed with which Gilliam's film fell apart, grinding to a halt in a matter of days, whereas the shoot on Fitzcarraldo took several months, and film-worthy incidents were few and far between. That Blank and Gosling were not there for the whole shoot is certainly a shame, but some non-chronological editing still gives the story a suitably memorable climax in the shape of the aforementioned hair-raising trip through the rapids, an incident that actually occurred early in the shoot (as evidenced by earlier shots of Thomas Mauch with dressed wounds that he has yet to receive), but in dramatic terms so difficult to top that its relocation feels right. Even in retrospect, Burden of Dreams is a consistently fascinating look behind the scenes of a troubled but hugely ambitious production, providing a window into the tortured difficulties that sometimes go hand-in-hand with creating great cinema, and giving us a rare glimpse of one of cinema's true mavericks at work. Its high reputation is fully deserved, but the film has too often been used as a stick with which to beat both Herzog and Fitzcarraldo itself, the common cry being that the making-of documentary is actually superior to the work whose construction it is recording. As far as I'm concerned this is complete nonsense, as despite being unfavourably compared to Herzog's similarly located Aguirre, the Wrath of God (and come on, that was a work of cinematic genius, so what chance has Herzog got there? ), Fitzcarraldo is still marvellous cinema, and the passing of time has done nothing to convince me otherwise, despite Nelson Muntz's protestation in The Simpsons that "The movie was flawed!" Championing a less widely seen or distributed film as a way of taking a poke at one that has achieved more widespread fame has been a weary critical sport for some time, and though it is sometimes justified, too often it is little more than a lazy short-cut to critical hipness*. Fitzcarraldo is, in Blank's own words, "an amazing film," and both it and Burden of Dreams deserve to sit side-by-side on anyone's DVD shelf. Given that the film was shot on 16mm negative stock (and what looks like high speed stock at that) in often less than ideal conditions, grain is inevitable and you certainly get it. Colours are generally faithful, though lean towards green due to the dominance of the landscape and the lack of strong colours in most shots. Contrast and black levels are fine, and the overall look will hold no surprises for anyone familiar with post-vérité low budget documentary works. Dust spots and print damage are very rare – the print has been very effectively cleaned up for this release. The picture is in its correct 4:3 aspect ratio. The sound is Dolby Digital 1.0 mono and is clean and distortion free, if restricted in is dynamic range. Though at first glance not one of Criterion's feature-laden releases, there are a fair number of very good extras on offer here. Les Blank's 1980 short Werner Herzog Eats His Shoe (20:15), one of the films that helped land him the job of shooting Burden of Dreams, is included in its entirety. The result of a bet made with the then fledgling film-maker Errol Morris (Herzog said that if Morris ever made a feature then he would eat his shoe – Morris made Gates of Heaven), the film is a light-hearted but revealing and engaging portrait of the maverick director, who states that we should declare open war on TV commercials (I told you he was a God) and suggests that cooking and walking are the only viable alternatives to film-making. Both are demonstrated on camera, the former proving the funniest as Herzog carefully prepares the ingredients that he will cook with the shoe to at least give it flavour. The title event itself has a sense of spectacle, as Herzog climbs on stage, compares his cooked shoes to Kentucky Fried Chicken and hopes his actions will serve as an encouragement to anyone who wants to make a film but "doesn't have the guts," encouraging his audience to do whatever they have to in order to make their films, including stealing equipment and stock. He also recalls the time on Even Dwarfs Started Small when he fulfilled a promise by throwing himself into cactus, an act that he still carries the scars from. Dreams and Burdens (38:00) is a substantial four-part interview with Herzog conducted in 2005, in which he looks back at the making of Fitzcarraldo, both as he remembers it and how it comes across in Burden of Dreams. He talks about the casting, his relationship with Kinski, Les Blank's films, the reasons for actually pulling a ship over a mountain, the safety issues surrounding it, and that trip through the rapids. He also addresses what he believes are the strengths and weaknesses of Burden of Dreams, which he describes as recording just a small segment of the production and criticises for omitting important information, but also calls it the only 'making-of' film that is not "embarrassing." This is presented in anamorphic 16:9. Criterion have usefully included a commentary track by director Les Blank and editor and sound recordist Maureen Gosling, with Fitzcarraldo director Werner Herzog recorded separately and edited in when appropriate. Herzog himself notes the oddity of him commenting on a film that is effectively a comment on him and his work, but contributes some useful information regarding the location and people, and his reaction to Blank and Gosling's work, which he admires but at times he wishes had never been made. He also points out, as mentioned above, that the film does not provide a full picture of the shoot because Blank and Gosling simply were not present for many key events, and claims that Blank missed some simply because he overslept. He also talks about the content of his "obscenity of nature" monologue, making reference to what he calls the "Disneyfication of nature" and labeling the manic Kinski as a tree-hugger. Blank and Gosling (mainly Blank, it has to be said) provide a useful background to the making of the film, expanding on its ethnographical elements and confirming that many of the natives did finally gain legal ownership of their land and that Herzog was instrumental in making this happen. How fresh the information seems will depend largely on whether you listen to the commentary first or read Blank and Gosling's diaries, as there is some overlap here. Two deleted scenes (5:52) show completely opposite sides of leading man Klaus Kinski and are presented 16:9 anamorphic as extracts from Herzog's documentary on Kinski, My Best Fiend, in which they were used. The aforementioned (and fascinating) Kinski rant is counterbalanced by a quite magical sequence in which the actor, in a state of cheerful serenity, performs a gentle hand dance with a friendly butterfly. The trailer (1:28) is presented 4:3, is in good shape, has the same downbeat voice-over as the main feature and includes a few shots not in the film itself. The '40 minutes longer' caption makes reference to the hour-long cut-down version delivered for PBS television, who put up some of the money. Stills gallery is a substantial collection of photos taken largely by Maureen Gosling covering a wide range of subjects and divided into 12 categories. They are reproduced at close to full screen. Finally there two non-DVD-based extras in the shape of an essay on the film by author Paul Arthur entitled In Dreams Begins Responsibilities, and an accompanying book featuring Les Blank and Maureen Gosling's on-location diaries. These document both visits to the location and record not only the events and the details of day-to-day life in the location camp, but also the attitude of the pair to this sometimes arduous adventure. There is an overlap with information supplied in the commentary, but this is still enthralling reading, in part for being a non-retrospective (and thus sometimes very directly honest) view of the shoot. Burden of Dreams remains one of the most compelling visual records of the film-making process, in part because it is about more than that, but mainly because the its subject and participants are just so damned interesting. That it feels a few shades short of complete is not really a problem, as what is there makes for fascinating viewing, and the film is very well supported here by supplements that allow some critical feedback from the film's principle subject, a rarity in itself. Criterion have once again come through here, delivering a fine DVD of a film that should prove essential viewing for all of those interested in just how hard it is to pull realise a cinematic dream, and just how far someone of vision and determination will go to do so. * Recently, for example, several critics have used a number of new feature documentaries to bash Michael Moore, conveniently ignoring the simple fact that it was Moore's very success that enabled most of those films to be made and shown in the first place.